During celebrations to mark the 50th celebrations of independence and his 50th birthday, King Mswati III announced that he was officially renaming the country the "Kingdom of eSwatini". The new name means "land of the Swazi". The King had already used the new name when he addressed the United Nations General Assembly in 2017 and at the opening of the country's parliament in 2014. The flag also has a picture of a shield and spear. These two symbols stand for protection of the country from enemies. 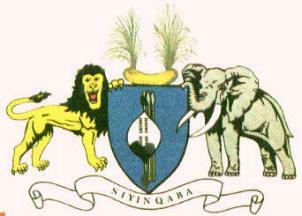 The shield is black and white to show that black and white people live together peacefully in eSwatini (Swaziland). The flag was officially hoisted on 30 October 1967. It is based on the flag, granted by King Sobhuza II to the Emasotsha Regiment in 1941. This flag, amended slightly, was hoisted on 25 April 1967 when the British Union flag used during the colonial period was hauled down. The blood red color is the symbol of past struggles; yellow points at prosperity by the richness in minerals; blue is the colour of peace. Source: Pedersen, "Moussault's Lexicon van vlaggen en wapens", 1980 [ped80]. The flag hoisted for the first time on 25 April 1967 on the occasion of the pledge of the oath by King Sobhuza II. After its registration with the College of Arms in London on 30 October 1967, it was was adopted in a slightly different form. The flag is based on the flag granted by the King to the Swazi Pioneer Corps during the Second World War in 1941. The Swazi ox hide-shield belongs to the Emasotsha Regiment. Source: Rabbow, "DTV-lexikon politischer Symbole", 1970 [rab70]. "The Swaziland flag, based on the royal standard woven nearly 30 years ago, has now been registered at The College of Arms in London. The Garter of Arms and The Windsor Herald Registrar submitted, on 30 Oct 1967, a final exact design which received the approval of HM King Sobhuza II. a) A rectangle with sides in the proportion 3 to 2.
b) Five horizontal bars in the proportion, vertically, of 3 mid-blue, 1 yellow, 8 crimson, 1 yellow and 3 mid-blue. c) On the wide crimson bar, a black and white Swazi shield of the Emasotsha regiment, in a sideways position, as when carried walking. The black portion of the shield is towards the hoist (flagpole) and the decoration injobo-feathers of the lisakabuli (widow bird) and ligwalagwala (lourie bird) hangs from the upper portion of the black. This particular injobo is used only by the King. d) Behind the shield are two spears (tikhali) and a staff (umgobo) with tassels (also royal tinjobo). The spears point towards the fly, away from the flagpole, and are above the stick. All three of these accoutrements lie horizontally. They are in their natural colours. On the flag, crimson stands for battles of the past, yellow represents the wealth of the resources the country possesses, and the blue signifies peace". I only have a partial text of Act No. 36 of 1968 which established the flag. It does confirm the stripes as 3 mid-blue, 1 yellow, 8 crimson, 1 yellow, 3 mid-blue. These were originally regulated according to the now redundant British Admiralty System as: Black T11, White T819, Crimson T816, Yellow T820 and Blue R813. According to the official model I have on file, the Pantone colours given in the Album are too dark (and the ones illustrated on FOTW too light). Civil use of the flag: The text I have makes no reference whatever to civil use of the flag (or otherwise). For Swaziland : PMS 638 blue, 102 yellow, 199 pink, 430 grey, 491 brown and black. The vertical flag is simply the horizontal version turned 90 degrees clockwise. The two supporters are the symbols of power for the King (lion) and the Queen-mother (elephant). The shield is a typical Nguni shield used in the country. The weapons on the shield are typical local weapons. The colour of the shield is derived from the King's own regiment. Siyinqaba means: We are the fortress "We are a tower of strength".